Comfort and adventure in a single cup! Freshly ground Yorkshire chillis, star anise, cinnamon and nutmeg are combined with the highest quality dark chocolate to create this amazing blend, inspired by the original Aztec brew. Mix up at home for a rich, warming drink. Five servings are included in a beautiful gold tin. Also available as a large and small bar. 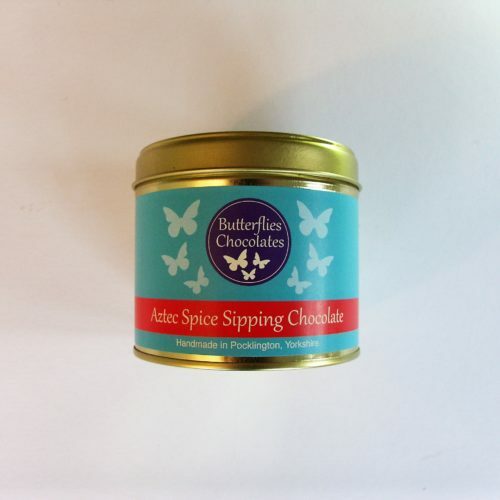 Dark chocolate (cocoa mass, sugar, cocoa butter, emulsifier: soya lecithin, natural vanilla flavouring), ground cinnamon, ground star anise, chilli flakes, ground nutmeg.